More than 300 provincial enforcement officers will patrol public land, parks and protected areas this spring and summer. Environment and Parks Minister Shannon Phillips addresses public land enforcement prior to the May long weekend. Over the upcoming long weekend and throughout the rest of the season, provincial government staff will once again work together to ensure everyone understands and follows the rules and regulations that protect public lands. Last year, provincial enforcement officers issued 6,595 charges and warnings for various offences on public land. Of those, 644 were for offences under the Public Lands Act and Public Lands Administration Regulation. Fish and wildlife officers, conservation officers, park rangers and RCMP work together to enforce legislation on public land. Environmental protection officers, lands officers and forest officers also play an important part in monitoring for issues and educating land users about responsible practices. This year, enforcement personnel will be able to write on-the-spot tickets for an additional 38 new and increased specified penalties for existing public land and water bodies offences. These changes mean enforcement personnel can spend less time in court and more time on the landscape. 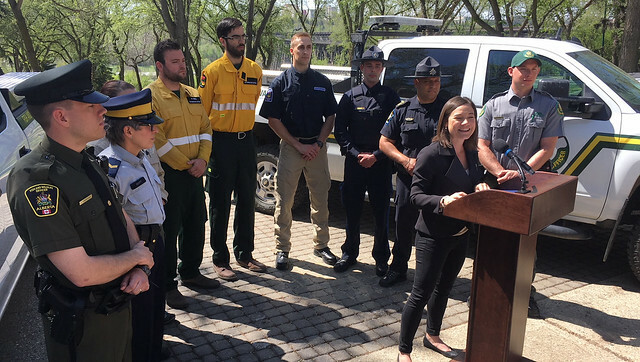 "These new procedures will allow our officers to operate more effectively when it comes to protecting the integrity of Alberta’s beautiful lands and waterways. Any process that increases efficiency in our day-to-day duties frees officers to better serve their communities in other capacities." Entering a restricted/prohibited area in a Public Land Use Zone will net violators a $402 fine and failing to report to a mandatory watercraft inspection station will cost $310. Fines for random camping on public land for more than 14 consecutive days will increase from $172 to $287. The changes will come into force on May 31. "The Alberta Fish & Game Association applauds the government's work to clean up public land. Destructive, irresponsible use of public land gives us all a black eye. We have always been in favour of increased enforcement alongside a comprehensive education, information and awareness program about stewardship of our public land and waters. We continue to be in favour of access to all public land in a responsible and non-destructive manner." Anyone who witnesses a serious public land abuse can phone the Report A Poacher line at 1-800-642-3800 or visit the Report A Poacher website. In addition to enforcement actions, more than 116,000 brochures, maps and information cards were handed out last year. Also, almost 2,500 educational, wayfinding and regulatory signs were developed and distributed. A report outlining last year’s education, prevention and enforcement efforts is available online. Statistics on enforcement actions will be published online every 14 days. Special compliance reports will be published after every long weekend.